Rich in mineral salts such as calcium, iron, phosphorous and vitamins, this product is distinctive for its intrinsic anti-oxidant, refreshing properties. 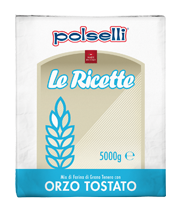 Obtained by using a low-temperature toasting process, this flour gives the finished product a golden colour with an intense but pleasant aroma. Type ‘1’ soft wheat flour, toasted barley flour, rolled oats.